This is how to add in a new users to the system, one user at a time. To enter multiple users, set them up on a spreadsheet and import them (see importing multiple users). 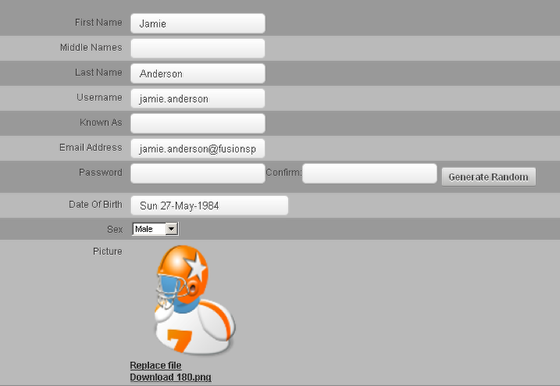 On the Administration Site click on "People"
-Picture: An image of the athlete can be displayed beside your Know as details. Browse, select and upload the image. You MUST add in a password for each new user into BOTH password boxes. if you do not, you will not be able to save the details about the new user. The Password is NOT shown with the user account information due to security, so once you enter in the password you need to securely keep a copy of it so you can include it in the users login e-mail. Passwords need to be a minimum of 6 characters. For security try and use a mix of letters and numbers. NEVER use a simple 123456 or just a first name. The Generate Random should ONLY be used when you are adding users to the system and they will NOT be logging in to enter or view data about them selves. This was set up specifically to allow the Administrator to add new athletes whom would not be logging to the site. Use the << arrows to move between years and the < to move between months to select the correct date using the pop-up calendar. 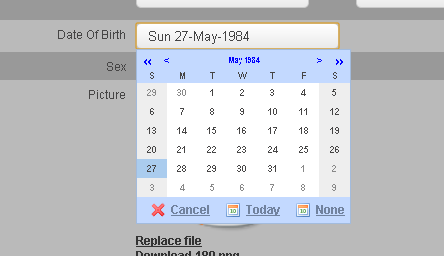 Move to the correct date and then right mouse click on the correct day. -Phone Number: Phone numbers are used for text messages. 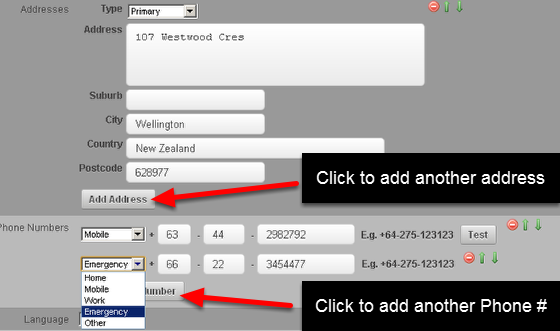 Phone numbers need to be entered as International Code, National Prefix (drop the 0) and then Local Number. For example, 0064 (03) 453 2768 becomes 643 453 2768, or a New Zealand cell phone 0064 0275663 877 becomes 642 756 63877. You can add multiple phone numbers by clicking the "Add Phone Number". Ensure they are labeled correctly (e.g the mobile is actually the mobile number). Mobile Phone Number Test: Once you write in your cell phone number, you can click on the "test" button. The system will send a text message to that phone number to verify it is correct. A notification will also appear saying "valid phone number". If it doesn't then try again. It is critical that you add in the correct Phone number as text messages may go to this number regarding confidential information.. so you MUST test it. The entire site will appear in that language apart from the labels for athletes and coaches. These must be set by your site Builder. An active button has been added to each users account. A user CANNOT login unless they have Active ticked for their account information. This Active button is only visible when viewing the Users account information on the admin tool. The users will not be able to see this on their own account information on the application. If you do NOT activate them then they will not be able to login. Favourite Events: These are events that you can choose to appear as a separate button at the top of the Home Page, and that event appears at the top of the list in the sidebar, as well as having links to it by the athlete's picture on the sidebar and on the Sidebar that always show. 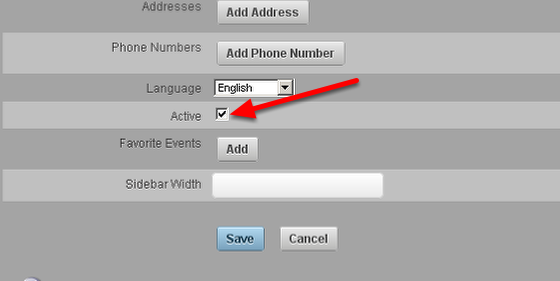 Usually you would select an event that is used daily, but you do not have to select any events. Sidebar Width is set in pixels. The default width is about 220-250 pixels. You can make it wider or narrower to fit your needs (see the section in the application help on section width for more details). Make any necessary changes and select "Save" to update the users account. In order for a user to be able to login to the system, they MUST be added to a Role that enables them to enter/view information on the system. They MUST either be added as a Coach of a group, or as an athlete in a group. See the help sections on Roles and Groups to find out critical information about setting these up. 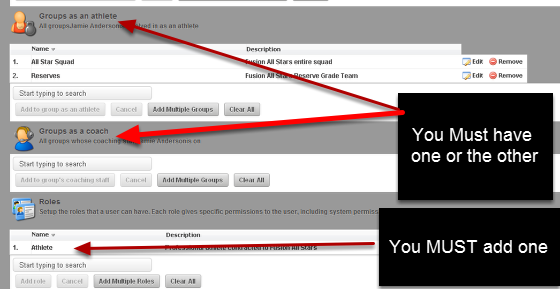 However, if your athletes do not need to login then they will only need to be added to the correct Groups as an Athlete. Once you have added them to the system, double check their login information is correct by logging in on the system as that user, and then send out their login information and security information now. The example here shows that the athlete has been added to 2 groups. Prev: What is a user? Because it is against good security practices to store the password in plain text. We can't view it ourselves either.